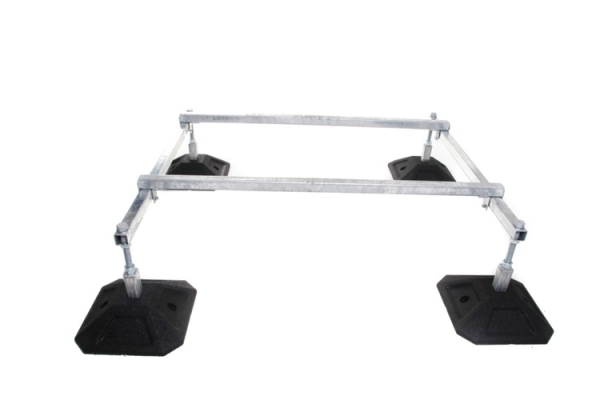 Adjustable Height Frames are 275-375mm high and are made from 40mm x 40mm galvanised box section which provides a very durable system that can hold up to 2,000 Kgs. The frames come in a full range of widths from 600mm up to 2m, with 1.2m long common rails for mounting. The common rails can simply be slid into position and locked into place using 2 x M6 nuts and bolts. If a larger system is required on site, two or more frames can easily be joined together, using our special double core foot. The frames feet are made from durable recycled rubber which is suitable for internal or external applications in temperatures between -40C to +80C. They also provide built in anti-vibration, although we can also provide anti-vibration pads or strips if additional cushioning is required.